Pictured below is a terrific vintage modernist blown glass decanter designed by Joel Phillip Myers for Blenko, Milton, WV, 1965. The model number is 6532, and the color is Peacock, a dark, rich, teal color that was only produced in 65 and 66. The thickly blown piece features a modern, sculptural design with a gracefully curved flaring body, long cylindrical neck, and a big, hollow-blown, mushroom-shaped stopper. Its a substantial, beautifully executed piece in a remarkable color with big visual impact; I believe examples in peacock are relatively hard to find. It would be a fine addition to any collection of Blenko glass, and would look great in any Eames or Danish modern inspired setting. 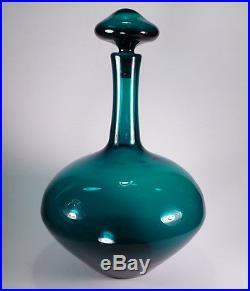 Measurements: The decanter stands about 13 ½ tall including the stopper, and is about 9 ½ in diameter at its widest point. The stopper measures about 3 ½ in diameter at its widest. Condition: The piece is in excellent used vintage condition, with no chips, cracks, repairs, or serious detractors. There is a ring of internal residue at the very bottom of the interior, otherwise the walls of the decanter are clean. There is table wear on the bottom around the big open pontil, expected on a piece of this vintage and weight, as well as some tiny stray bubbles from the blowing process. Marks: The piece is not signed or labeled. Please see my other auctions for more mid-Century modern design, vintage decorative pieces and jewelry. Thanks very much for your interest. The item “Excellent Mid-Century Modern Blenko Peacock Tall Decanter, Myers 1965, #6532″ is in sale since Sunday, January 22, 2017. This item is in the category “Pottery & Glass\Glass\Art Glass\North American\Blenko”. The seller is “ljs61″ and is located in Atlanta, Georgia. This item can be shipped worldwide.